Scandal is afoot at Quaker. 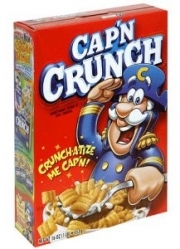 Cap’n Crunch has been outed for not being a real Captain. The truth has been right in front of us for years – the three stripes on Cap’n’s uniform signify the rank of Commander – yet, we have been blinded by Quaker’s deceptive advertising. Certainly, a class action among the millions duped into enjoying the fraud’s variety of cereals over the years is in the works. Tell that to all of the legitimate captains that have come before you, Cap’n. As Gawker has noted, because Cap’n commands the S.S. Guppy, he is entitled to be addressed as Captain regardless of his official rank. Even so, consumers have been purchasing the cereal for years under the assumption that it had been blessed by a man who had fully paid his dues. With no disrespect to Commanders, something about the cereal now seems less fulfilling. The food and beverage industry must be run amok over the scandal. Somewhere, we expect the good folks over at Coca-Cola are checking the credentials of Dr. Pepper, hoping the guy actually received his degree. Can you imagine the outcry if Dr. Pepper lovers discover they have actually been consuming an over-priced Mr. Pibb all these years? Where will the carnage stop? Companies are right to utilize the services of spokespersons to market their products. A likeable spokesperson helps consumers identify with a product. But, companies need to start engaging in thorough background checks in order to save themselves from Quaker’s embarrassment. Certainly, in this case, checking the official rank of a military veteran would not have been outside the scope of discovery.